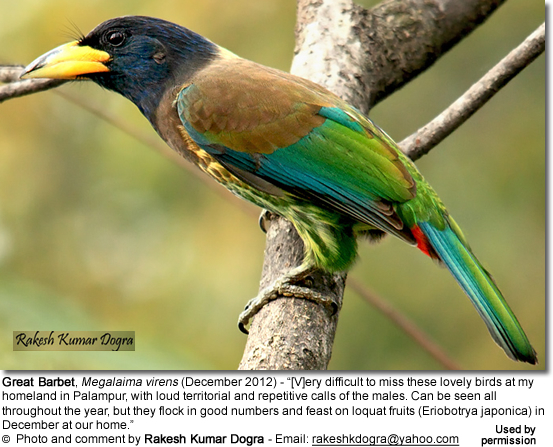 The Asian Great Barbets (Megalaima virens) are the largest of all barbet species. The name "Barbet" is derived from the French word "barbe", which means "beard," and in this context refers to the bristles which fringe their heavy bills. 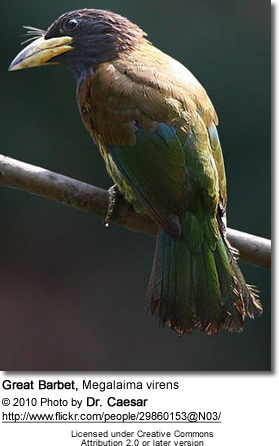 The Great Barbets' natural range stretches from north-eastern Pakistan through the Himalayas east to southern China and south to Laos in northern Indochina, Thailand and Burma / Myanmar. They are typically found in broadleaf evergreen forests between about 2,000 - 8,500 feet (600 - 2,565 meters). They are resident (non-migratory) within their range. They are usually seen alone or in pairs, except after having raised young in which case fledglings may accompany them. Larger numbers of them may occur at favored fruit trees. Range: Central Burma and southeastern China south to north central Thailand and northern Vietnam. Range: The North-West Himalayas in northeastern Pakistan - from Murree and Mussoorie, Kashmir, Garhwal to western Nepal and Sikkim. ID: Similar to the above, except for a paler plumage and a pale or yellow streaked collar on the extreme hind-neck and upper back (absent or minimal in the above). Range: Eastern Nepal east to central Assam in northeast India. Range: Northeastern Assam, northern Burma, western Yunnan in southwestern China and northwestern Thailand. [ (Megalaima virens mayri - Ripley, 1948) ] - Integrated with ssp. clamator. Range: Mishmi Hills in northeastern Assam in northeast India. [Megalaima virens indochinensis - Rand, 1953) - Indochinese population integrated with nominate race. 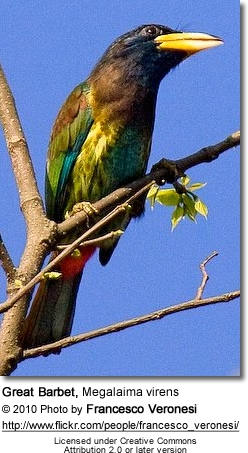 This largest of all barbet species measures about 12.6 - 13 inches (32 – 33 cm) in length (including the short tail) and weighs about 7.4 oz (210 g). It has a relatively large head and short neck. The plumage is mostly green, except for the blue head, the brown back and chest, the green-streaked yellow abdomen and the red vent. Large yellow bill with black culmen (upper ridge of the beak). The flight is strong but dipping. Males and females look alike. Immature birds resemble the adults. Great Barbets mostly feed on fruits, flowers, buds and seeds, but will also eat a wide range of insects, including moths, mantis, ants, cicadas, dragonflies, crickets, locusts and beetles. They usually forage in the higher branches of tall trees. They usually nest in tree cavities, which may be the deserted nesting-holes of Woodpeckers or natural hollows, between 10 - 15 feet (3 - 4.6 meters) from the ground. The average clutch consists of 2 - 4 eggs (occasionally 5) that often show very faint, depressed lines running longitudinally down the eggs. The incubation period (to hatching) is about 13 - 15 days. The male's territorial call is described as a very loud kay-oh. Other vocalizations include the alarm / sentinel call - a harsh keeab; repetitive and wailing notes of pio-pio-pio-pio and un-nee ao, un-nee ao.